After 13 months of decline, India’s export growth is set to turn positive for November. Imports, too, might turn around. A strong rebound in foreign trade, however, seems far off. Meanwhile, India’s trade deficit is likely to shrink substantially in FY10. Exports contracted 6.6% year-on-year (y-o-y) in October—the smallest decline since January—while imports declined 15% y-o-y. October was the 13th straight month in which exports registered a decline. For FY10 year-to-date (April-October), exports and imports contracted 26% and 29.6%, respectively. Oil imports (value) have been rising after reaching a four-year low of $3.3 billion (Rs15,345 crore) in February. In October, oil imports rose to $6.6 billion—double the February level—as crude oil prices had increased around 70% since then. 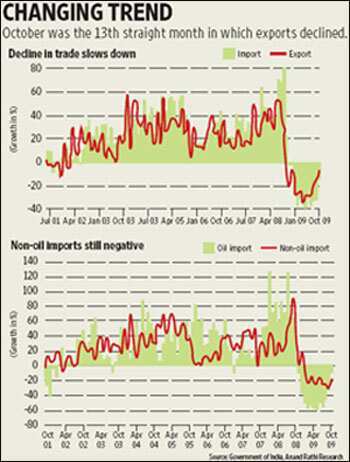 Non-oil imports contracted by 17.2% in October, after declining 30% in September. Though much of it comes from the relatively low base in October 2008, this category seems to be stabilizing as domestic demand improves. Trade deficit started moving up after shrinking to a mere $2.2 billion in February. A sharp correction in global commodity prices along with feeble global demand played a major role in reducing the trade deficit earlier. As global commodity prices have started moving up, trade deficit is likely to increase, though gradually. We, however, expect India’s FY10 trade deficit to be much lower than the FY09 level. As most developed countries emerged from the recession in the September quarter, global demand is likely to improve, albeit at a slow pace. This, coupled with a rebound in global commodity prices, could improve the outlook for India’s exports. The sharp fall followed by the strong run-up in international crude prices are pushing up oil imports ahead of non-oil imports. India’s robust growth in the second quarter of FY10, 7.9%, indicates a likely spurt in non-oil imports as well. Barring a large revision in past data, we expect both export and import growth to turn positive from November. A strong recovery in foreign trade, however, seems far away.